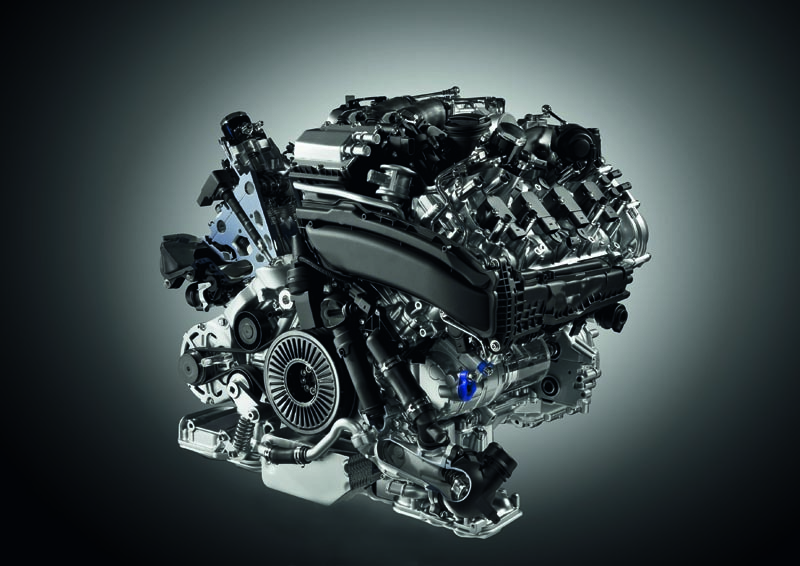 For over a decade, Audi has been utilizing the 4.2-liter V-8 as a jack of all trades engine for cars ranging from the A8 and Q7 to performance cars like the RS5 and R8. 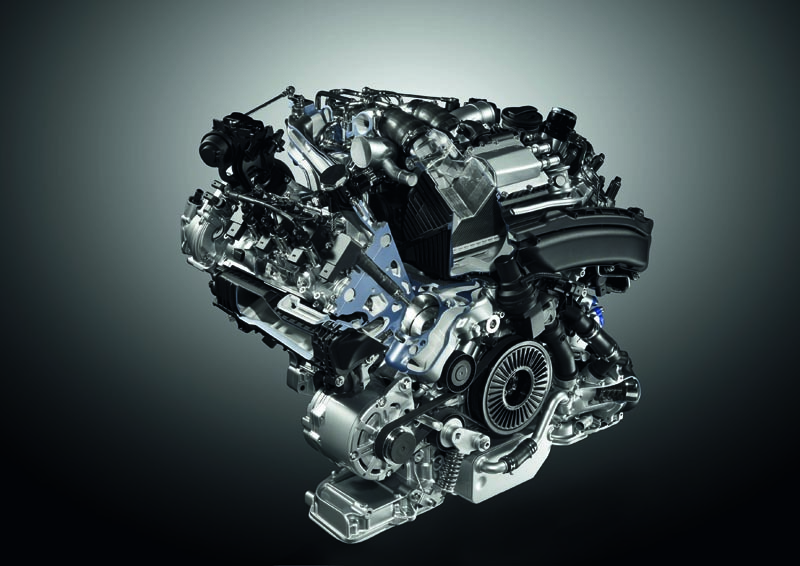 But as the automotive industry moves towards achieving greater fuel efficiency and power, the 4.2 FSI is heading towards the junkyard to make room for the new 4.0 TFSI. Audi’s new 4.0 TFSI is the newest engine in the German automaker’s lineup, and will find itself in the S and RS models in the future. 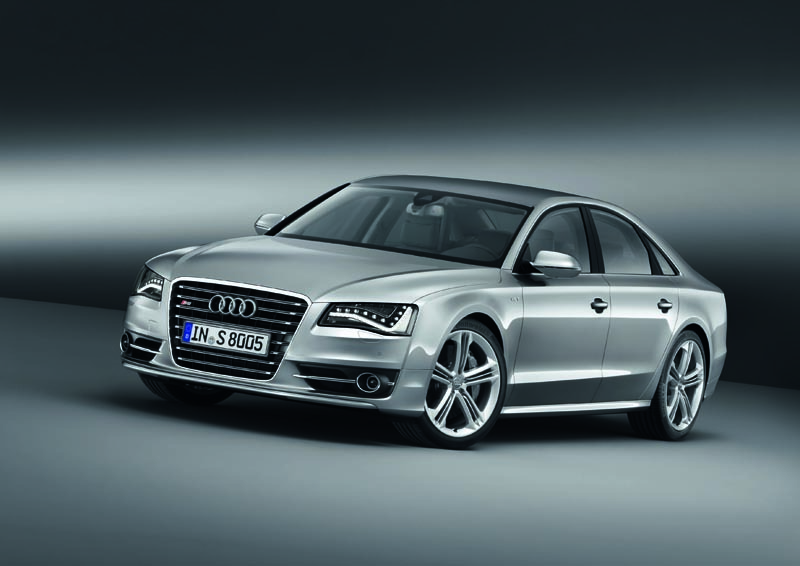 The engine made its debut in the Audi S6, S6 Avant, S7 Sportback, and S8 during the 2011 IAA Frankfurt Auto Show. The 4.0-liter engine features a 90-degree cylinder angle lightweight cast aluminum-silicon alloy cylinder case, and chain-driven camshafts and auxiliary units at the rear to save space. 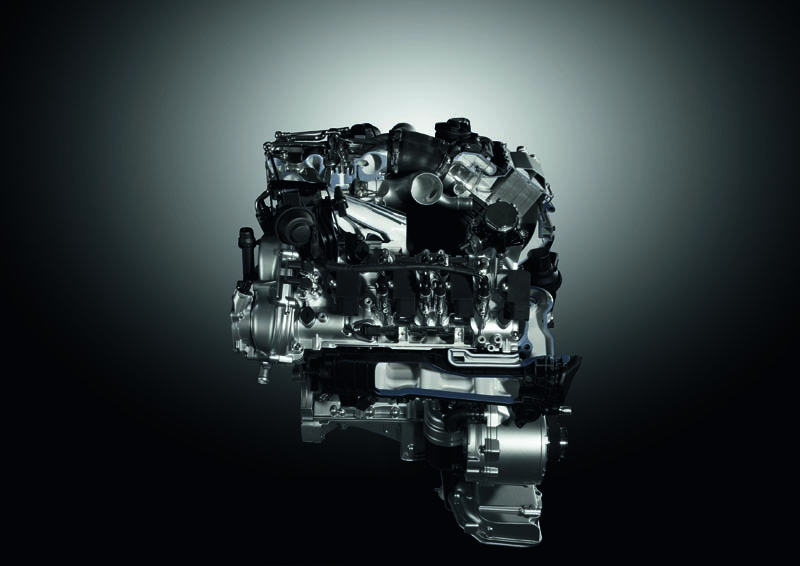 The compact V-8 engine has a length of just 19.57 inches (497 mm) to save space. The Audi 4.0 TFSI is capable of high power figures as showcased in the new S models unveiled in Frankfurt. 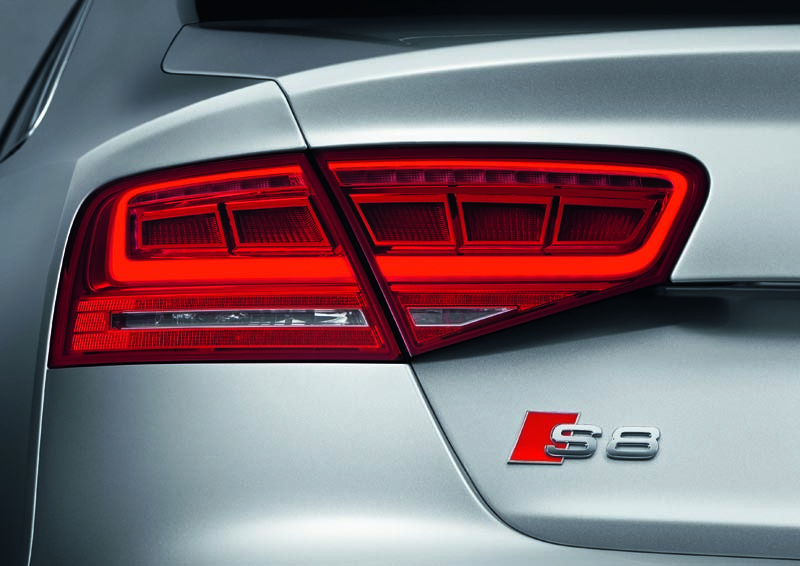 In the S6 Sedan/Avant and S7 Sportback it makes 420 horsepower and 406 lb-ft. of torque rocketing all three models to 62 mph in under 5 seconds. In the big, bad Audi S8, the 4.0 TFSI produces 520 horsepower and 479 lb-ft. of torque to help give the S model a 4.2-second 0-62 mph acceleration time. 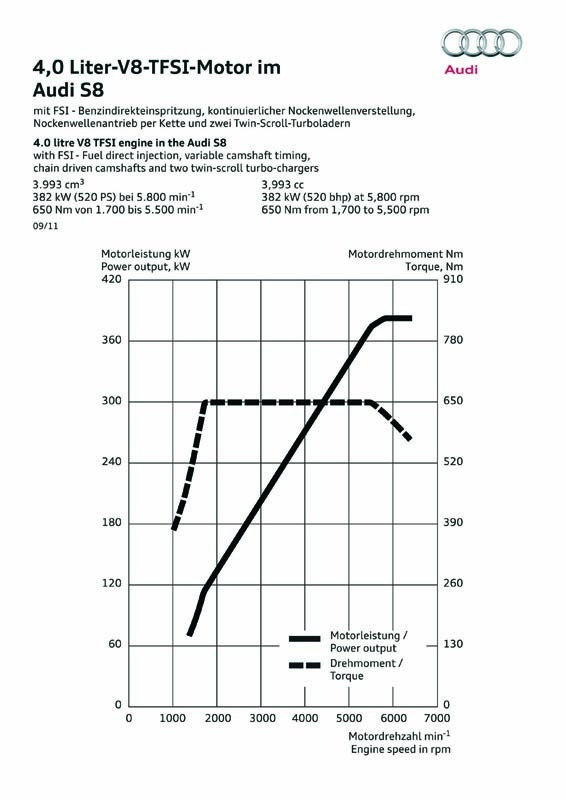 If Audi uses the twin-turbocharged V-8s in each of the RS models, the output figures should be north of the 520 mark, showing that the potential of the engine has not yet been reached. 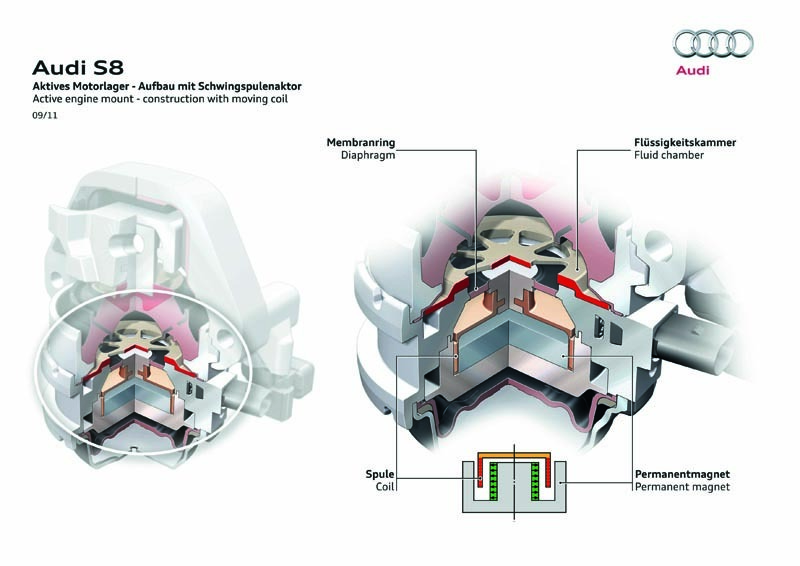 Unlike traditional applications of twin-turbocharging setups, each turbocharger and intercooler is placed on the inside of the cylinder banks rather than outside. This allowed Audi to configure the cylinder heads so that the exhaust side is on the inside and the intake on the outside, resulting in shorter gas paths and reduced flow loss. This design, in conjunction with twinscroll technology, also gives the Audi 4.0TFSI a very quick throttle response and helps develop torque right off the line. Along with the performance innovations, Audi has invested a great deal into technology to improve fuel economy and reduce emissions. 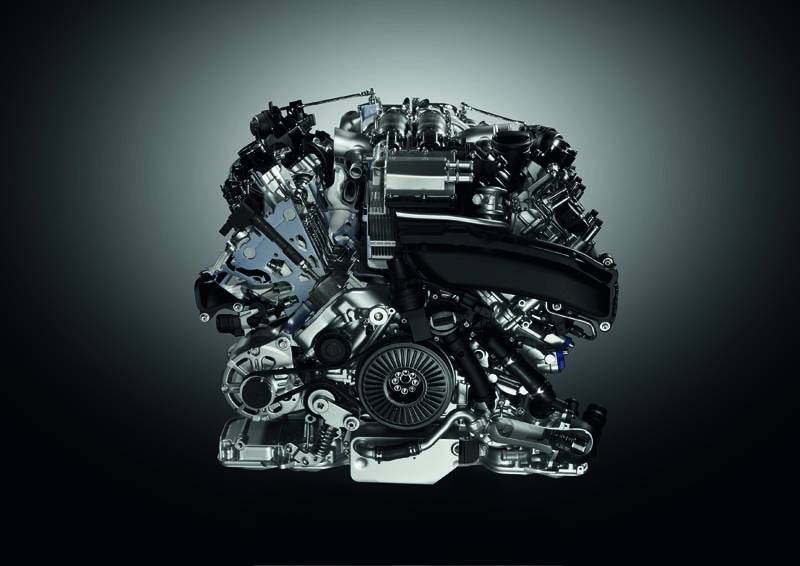 The blueprint of the 4.0 TFSI followed the trend of downsizing engines and utilizing turbochargers. 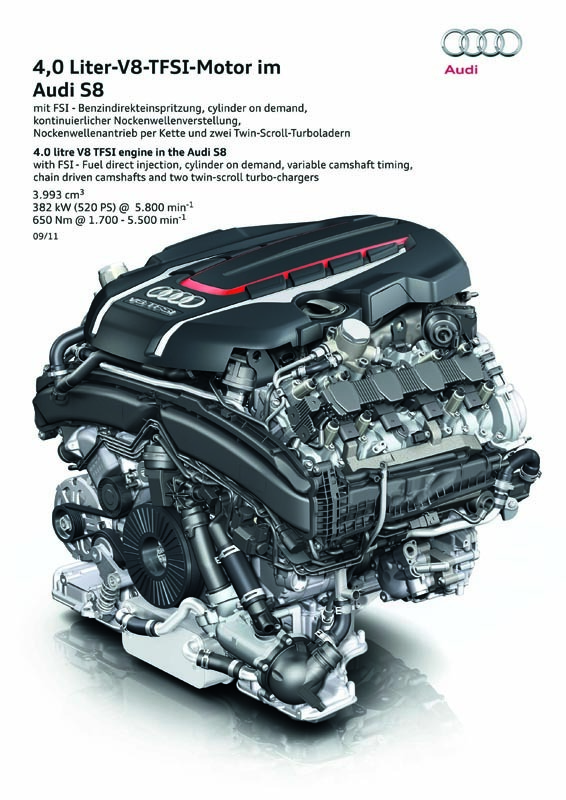 Current technology such as Audi’s FSI direct fuel injection system and regulated oil pump system were used with new innovations such as a start/stop function, thermal management, and cylinder deactivation where two sets of cylinders in each bank are seamlessly shut down under light and moderate loads. Upon startup, the water pump of the cold engine is deactivated to allow the oil temperature to rise quickly until it reaches the optimum operating temperature. The new Audi 4.0 TFSI will be used in all of the larger S models in the model range with outputs ranging from 420 to 520 horsepower. The engine will achieve greater fuel economy and lower emissions than the 4.2-liter V-8 and 5.2-liter V-10 that it effectively replaces. Is the new 4.0 TFSI an improvement over the 5.2- and 4.2-liter engines that previously powered the S-models? Leave a comment and let us know!